The SPBA Annual Tianguis will be held on Sunday, December 9, 2018. 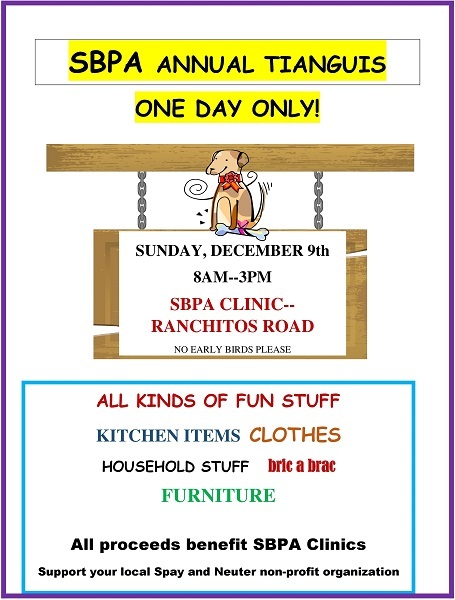 From 8:00am – 3:00pm (no early birds please) at the SBPA Clinic building on the Ranchitos Road, you will find all kinds of fun stuff to purchase for yourself or for that special someone for Christmas. There will be kitchen items, clothes, household stuff, furniture, and more. 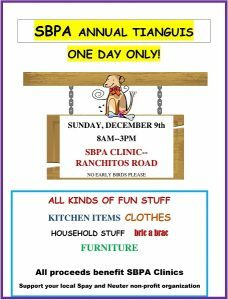 All proceeds benefit the SBPA spay and neuter clinic.